Your Vehicle's condition is Paramount to us, at Chagrin Auto Spa we are experts in Auto Detailing. Schedule the service for your convenience! We use only the finest products and our goal is to return the vehicle to you in as close to new condition as possible. From carpets to the dash; From the bumpers to the roof, You satisfaction with the condition of your vehicle is most important to us! Proper detailing helps to maintain your vehicle's value, and also provides a much more enjoyable driving experience. A clean vehicle runs smoother, is less likely to rust in harsh environments, and exudes an image of confidence! Ohio's harsh environment will most certainly damage your vehicle in more ways than one: your vehicles clearcoat, which protects your paint and improves shine, can be severely damaged by salt and corrosion; and your vehicles mechanical health can be damaged by ice and other road conditions. Washing and waxing regularly will protect against this. This seals the clearcoat against these adverse conditions and the wash keeps the ice and other contaminants from causing issues with the mechanical performance. 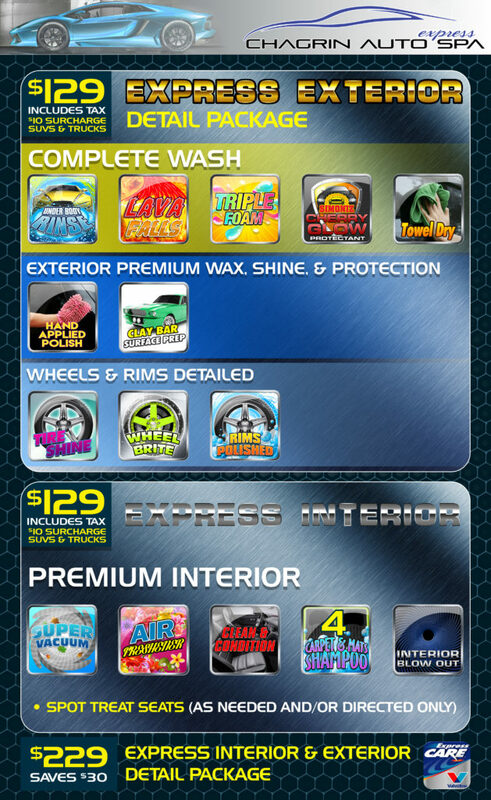 We at Chagrin Auto Spa take the highest pride in the look and feel of your vehicle. Our Exterior Detail Starts with our full wash, then we hand dry and clean the vehicle. Following that we wax and detail every surface to ensure maximum protection and shine! We also clean your tires and rims for you! For our Interior Detail, we vacuum and wash your carpets, and then apply protectorant to all surfaces, treat the leather, clean any cloth and return the vehicle to you in optimal shape. Our comprehensive detail package includes interior and exterior. We utilize the very best cleaners, polishes, waxes, steam cleaners, to ensure that your vehicle returns to you like new! Powered by Scion Consulting LLC.